We have heard numerous times the importance of innovation to businesses from a philosophical point of view. 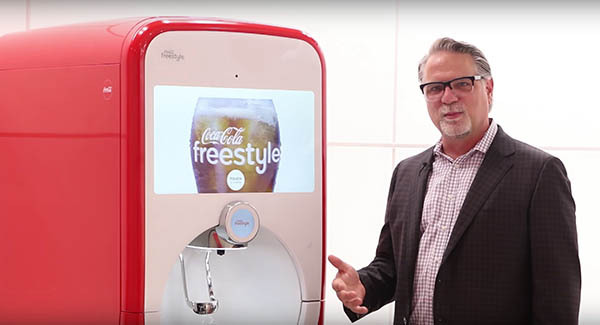 Taking it back down to a business perspective and putting it to application is Chris Hellmann, Global VP and GM at the Coca-Cola Freestyle Division. 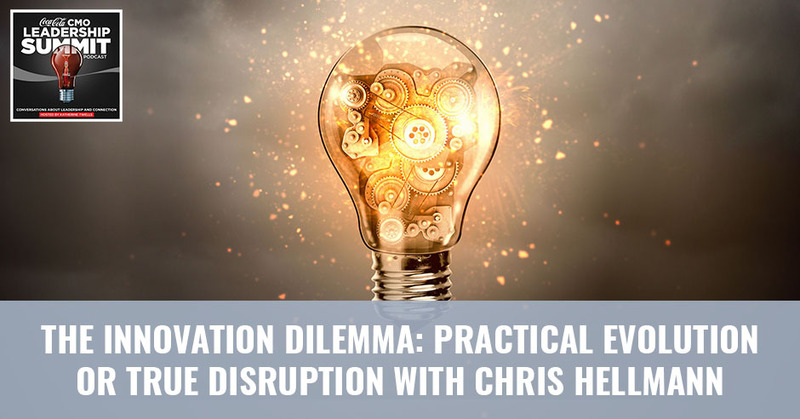 Chris shares the innovation dilemma that businesses have to contend with nowadays, and tackles whether it is practical evolution or true disruption. He uncovers the truth about the shelf life of innovation and what it has resulted through the numerous businesses these days – from Uber to Netflix. 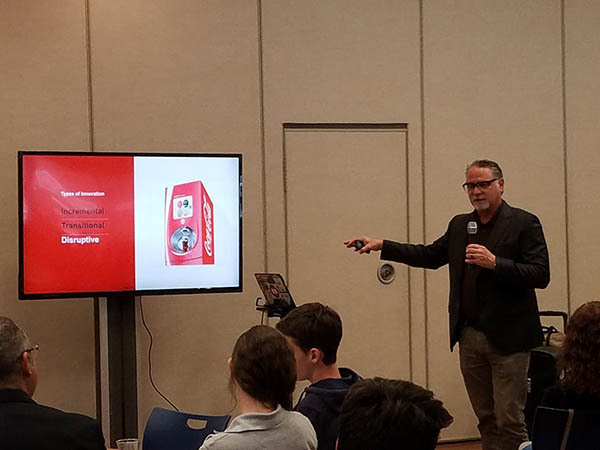 Chris shares what he has learned over at Coca-Cola and addresses questions, from how we think about innovation to managing that to work for us in our businesses. 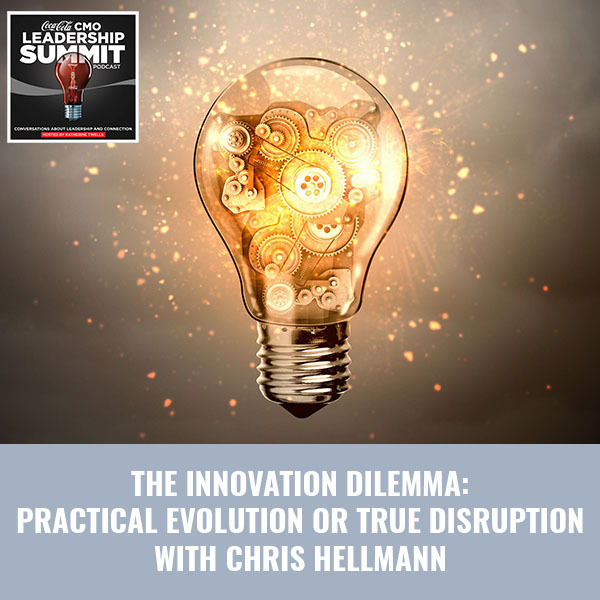 This is Chris Hellmann‘s talk titled The Innovation Dilemma from the 2018 Coca-Cola CMO Summit. As I was thinking about this talk and breaking apart my experiences before Coke and with Coke, I’m a marketing sales commercial guy. I started at BBDO and I worked in the agency business for a few years before I came to Coca-Cola. I was in marketing and account management and that little wedge at the top is what gives me a few credentials and credibility to talk about technology and innovation. For a couple of years, I’ve run the Global Center for Innovation with Coca-Cola Freestyle platform. Many of you know Coca-Cola Freestyle. You know those interviews you have along the way in your career, but you’re interviewing with your boss or some other people that know you so you can’t fudge the story too much. I feel like that a little bit too because I know a lot of you know about Freestyle. I can’t fudge the story too much. A couple years I took the lead of the Freestyle Global Center. The reason I got that job is I sold it as Freestyle’s at this moment now of we’ve grown. We’re in 50,000 outlets. We’ve got a lot of dispensers out there and it’s become this innovation that’s turned into a material part of our business. We’ll do five billion drinks through Freestyle. It’s about fourteen million a day. It’s become somewhat serious for us. Rather than bring in another technical person, we got lots of those in the group. You probably need somebody with sales and marketing and commercial experience to take this to the next level. It worked and I got the job. I’ve been doing this for a couple of years. It’s been a fascinating and amazing couple of years for my career as a marketing salesperson moving into this group. What I’m going to talk about is I’m not going to go all that academic or philosophical about innovation, because I can’t. What I’m going to do is from a business perspective talk about innovation. What I’ve learned over the condensed short period of time that I’ve been doing this and some lessons that the Coca-Cola Company has learned. I’m not going to turn this into a commercial for Freestyle. We don’t need to hear that. I’d rather stay with the important themes of how do we think about innovation? How do we manage that? How do we make it work for us in our businesses? Let me start with a level set of definition. This is from Webster’s. This isn’t that complicated. This is pretty straightforward and you could agree. There are lots of definitions out there of innovation, but the idea or the act or process of introducing something new, whether it’s a product, a process, etc. I think about it even a little simpler than that. A real definition of innovation is as simple as it gets. That is something new that we do, whether it’s a marketing program or a promotion or a new product or a brand extension that adds incremental value. That is a backdrop as a pretty simple notion of what innovation can be. Now, it starts to get a little more complicated. The world we live in, which you guys have talked about in good detail and live in your real worlds as you go back to your day jobs. It’s complicated to think about that simple notion of adding value. It’s complicated now by a couple of things that I wanted to break out that my group deals with on an ongoing basis. You can see here the compressed business cycles. Everything’s moving faster than it ever has. I don’t have to dwell on that because you feel it. Every day, every morning when you wake up, every day you go into work. Similar to the compressed business cycles is this notion of short shelf life. Innovation and invention have an incredibly short shelf life. The speed of technology is crazy. I’ll try to dimensionalize that but it’s almost impossible to dimensionalize because it’s moving fast. You’ve probably all heard the saying that, “Technology has never been as fast-paced as it is now and it will never be this slow again.” That’s the way we’re moving, enabled by technology. The thing that’s most important to me as a business guy who’s moved into this space is this idea or concept of real self-candid assessment of where you are. Where am I on this continuum? Do I need to completely disrupt my product and category that I’m working on? Does my situation call for a more moderate invention and the case for change? That to me is the epicenter here of what we’ve learned. There are lots of talk about disruption and for really good reasons. We’re not all in this point of disruption. Disruption is expensive and it’s risky and that you can lose pretty quickly. I’m going to try and dimensionalize that from our world a little bit. Innovation Dilemma: Disruption is expensive and risky that you can lose pretty quickly. Let me cover each of these if I can go forward not backward. I pulled this from an article that I read. The Credit Suisse says, “We argue that disruption is nothing new but that the speed, complexity and global nature of it is,” and then they go on to list industries that are at the epicenter, including food retail. I’m standing in front of leaders in food retail and food service. It’s a little ominous for me to be telling you that because you know it and you live it every day. Think about how this industry has changed. Of my many years at Coke, I’ve spent many of those in food service directly where they’re calling on customers or in customer marketing. The pace of change is crazy, whether it’s the food aggregators who are delivering your food. Whether it’s the way consumers are interacting with your brand. You’re at the epicenter of change and it’s moving quick. Business cycles, funny but we have this thing at Coke where we build an annual business plan. Now, we build our annual business plans and we present those and it puts a stake in the ground of what we’re going to do for the next year. A couple months later we have the re-plan conversation. We don’t even get the full cycle anymore. It’s a plan then a re-plan and that’s the way it’s going and it has to go that way because things are moving fast. Let’s talk about the short shelf life. One doesn’t necessarily think about short shelf lives when they think about innovation. They think about short shelf lives with products. That’s how we think about it a lot. A good example and anybody in the world can get up and give a presentation about innovation and they’re going to say something about Uber and how they’ve disrupted the category. That’s not the point. Uber disrupted the category and completely changed how we think about personal transportation. You would think that would give them a runway for the next many years to make money, hand over fist and to own this space. Not really. Uber has only been out a couple of years. We talk about it as if it’s in the fabric of our world and it is, but there’s so much competition to that now. If you take it even a step further, the idea of personal transportation is starting to disrupt Uber. I live in Atlanta and I know you’re from many cities around the country, but where did those scooters come from? They’re everywhere. I saw some out the window to this morning. That’s personal transportation. To rent a car now, you can rent someone else’s car and that’s all enabled by technology and a little bit of willingness on their part to lend their car. Uber’s great idea here was we have all these idle assets, let’s put them to work. They created the technology to enable that and they tapped into this huge need. That need is not completely fulfilled as you can see. It keeps shifting and changing all enabled and fast. Even though Uber created this great thing, the short shelf life nature of it is you better keep inventing and understanding your consumers’ needs. Outsize technology, I had a pager at one time for about a minute and I never knew what to do with it. Certainly, I’m not a doctor or anywhere near it but Coke issued pagers once. I don’t even know the year. That was a pretty short-lived thing because we needed more. Then came this thing called a flip phone. Now all of a sudden, we have the functionality of a phone and we can take pictures too, and this texting thing started. That wasn’t quite enough because the internet was exploded and I needed a device to be able to do emails. We’ve got a platform in our pockets that enable us to access the world, whether it’s personal transportation or sending a text, you name it. This has disrupted many categories and the iPhone came out in 2007. Ten years is a long time, but that’s a tremendous amount of technology in that ten years. The outpaced nature of it is impacting everything we do from an invention standpoint. In 1993, Blockbuster had 3,400 stores and growing. They were popping up about every market on every corner. They had stated that they want to own the entertainment business. They were in movies. They wanted to get more into music and video games. At that time in ‘93, they went through three CMOs in three years. They didn’t have a good footing on vision and how they want to move forward. In 1999, there was an article in the Chicago Tribune, “Imagine a Blockbuster night without Blockbuster. A time when no video store will ever slap you with a late fee or find you for failing to rewind because, in this world, there are no video stores. Only home entertainment.” That was in 1999. In 2000, Blockbuster had a chance to buy Netflix for $50 million. They said, “Our magic is in the store. People want to come to interact with us. They want to hold the covers.” No, they don’t. No, we didn’t. They passed on that Netflix thing thinking it was a niche business to send it to your home. Netflix market cap is $151 billion. They’re larger than Disney. They’re larger than Comcast. They missed the cue. There used to be a Blockbuster down the street from my house. It’s been fifteen things since then. At one point it was We Buy Gold. Getting to the central nervous system of what we’ve learned and what’s been my key takeaway in a couple of years in this space of innovation and invention and technology. It’s not if or when we’re going to invent and change, it is how and where. The how and where is important. The idea here is to do an assessment of where you are. Are you in a place where you’ve got a case for change? Where you have to continually evolve and change what you’re doing? A lot of us are. Are you on a burning platform? The definition of a burning platform is you’re standing in the middle of the ocean and the rig is on fire and you’re looking down at the water and you’ve got to make a decision. That’s not a great place to be, but we’ve been there. The case for change or burning platform, let’s try and make it even a little bit more academic. If I’m on the side of the case for change, constant evolution. If I’m on the side of the burning platform, disruption. How do you know? These are some metrics that you can think about. Ours is a little different but look at your business. If your growth has slowed, if consumers are rejecting the fundamental promise a little bit. If consumers’ needs have changed in your space drastically, if you don’t feel you have a tremendous amount of differentiation, let’s put that on the minus side and you better think about some breakthrough changes. If all those things are working, your business is growing, you’re adding a share and your profits are good. Don’t take off innovating but think about it differently. Think about it as more incremental, evolutionary. To bring it to a close here on our experience, I wasn’t going to turn this into a Freestyle commercial but I do want to use it as a case study or a fountain business in your world in general. The fountain business and food service have been around for a long time, over 100 years. That started with a rudimentary, we put syrup at the top of an urn and we put seltzer in the cup. There was some innovation. We added different dispensing technologies to around 1990 and that last a good long time and consumers would walk in and they’d have six or eight choices. In 2010, we felt we needed to disrupt the category a bit because it wasn’t all that differentiated. The equipment manufacturers were selling to us and they were selling to Pepsi. The choice of six options wasn’t all that differentiated in a world where we were starting to get a real sense of consumers want choice and this interactivity of touchscreens was becoming important. We created Freestyle. Since then, we’ve done some different versions of that. We’ve tried to take it into smaller footprints. We’ve taken it into different places. We’re looking at some small office options, but I will argue with you. I would say that since 2010, it has been incremental innovation for us. The disruption for us was the micro-dosing and the super condensed syrups that enabled so much choice in that, but we have been incrementally innovating since then to meet needs. When we disrupted the category, we distanced ourselves, we differentiated from our competitors. It’s difficult because of the technology for them to duplicate the highly-concentrated syrup. Yes, there are other dispensers out there that have a choice but it’s all based on legacy back rooms that have tremendous amounts of complication to them. Innovation Dilemma: Know where you are based on the data and the consumer information. You have to make good thoughtful decisions about where you are in the spectrum. This is where we are so far, “Where do we go forward?” I’m living in those exponential times like you guys are. I’m thinking about the incremental versus disruption. I would argue that our success for Freestyle is our ability to balance those two things, to balance this incremental evolution of the platform and to disrupt at the right time. From an incremental standpoint, we’re about to introduce some new platforms. They’re fundamentally built on the original platform. The difference is we’ve upgraded all of the technology inside. Now, we have a much bigger and better user interface. We’ve learned over the few years of how to add technology inside that reduces downtime. That makes it simpler for the crew. We’ve got a great new platform coming out, incremental innovation. We’ve gotten to a place where we’re working on new brands and new flavors and trying to keep it fresh and exciting. Maybe some of you have seen that or experienced that with your brands. We’re trying to make it easier to market to consumers. That’s all table stakes. We’ve got to continually do that and evolve. From a more breakthrough or disruptive point of view, which we know we have to because at some point in time, this isn’t going to be enough. We’re thinking about categories and occasions and different categories than traditional carbonated and still soft drinks. We all know the trends. We’re building platforms that will deliver hydration, whether it’s through DASANI and DASANI Flavors or Vitaminwater. We’re looking at new categories. We’ve figured out how to do and we’re going to introduce a cold press coffee through the existing Freestyles that we have, which we think is going to be important to tap into that breadth. The main thing that we’re going to do that’s different is a beta and this is in the test, but where once consumers were interested and driven to a choice and variety, which is what drove Freestyle in the beginning. That’s shifting a little bit. Consumers are moving to this place of personalization. I want choice and variety but I want to customize my beverage, my car, my iPad, my food experience for me. We’re working on and the ability for us since it’s all ingredient-driven, the ability to change ingredients. Think about a day when you can go in and interact with Freestyle and you can dial up your sweetness level. You can potentially dial up your caffeine or down, depending on what time of day it is. Powerade is our first real step into that, this Powerade Command Center. The idea here is to take the Freestyle to the advanced elite athletes. Figure out a way that the trainer or the athlete can personalize the ingredients they need, depending on where they are in their workout schedule. If it’s before the game, they may need X. This isn’t a dream or a pipe dream. We’ve got this in place at LSU. We’ve got several outlets at LSU but we’re testing this where the trainer can dial up the ions, potassium, magnesium, the things the athletes need when they need them. Whether it’s a wearable or your smartphone, there’s going to be a day when you’re going to be able to interact with the Freestyle dispenser on your needs. That’s where we’re headed. Our outlet got some coverage with Sports Illustrated. It’s in early days here and it’s rudimentary, but we’re getting there pretty quickly because there’s a tremendous amount of demand for it. The point is really know where you are based on the data and the consumer information you have to make good thoughtful decisions about where you are in the spectrum. 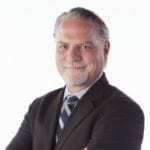 Whether you need to make a case to your CEO that we’ve got some real need for some breakthrough changes or we’ve got to continually increment and invent.